From CP1 to CP2 we had to notice that there’s a bridge over fast road (which was under a fence). 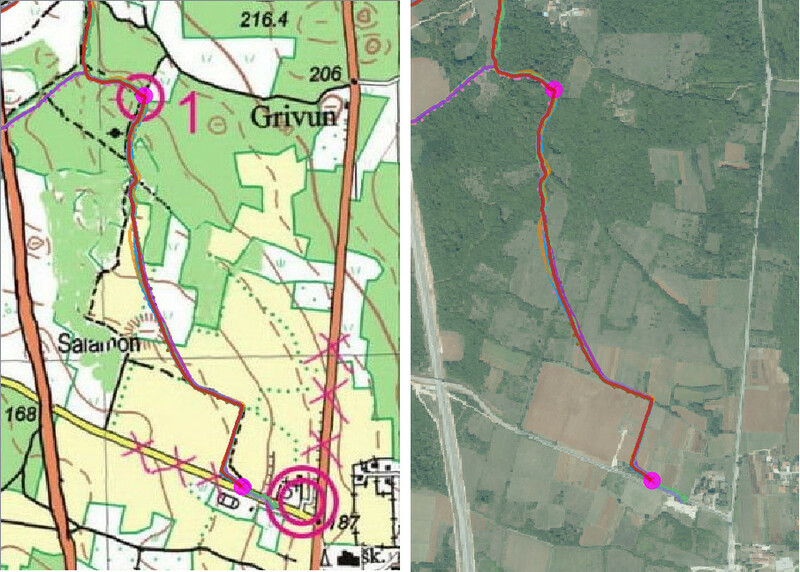 You can see how the fast road is manually drawn on basemap and that it’s a bit off to right, but that wasn’t a problem. 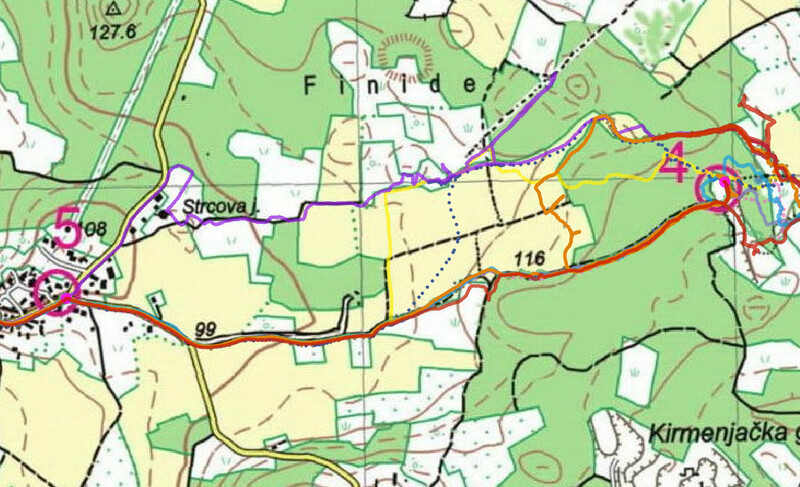 After CP2 we decided to take our chance and try to navigate over open meadows (white on map) and get to CP3. You can see that this CP was not that easy to find, a lot of different route choices, mistakes, dead ends and coming to CP from both directions.  Our track is still red. The problem was that we tried to navigate based on vegetation which is not possible on such old map. Satellite photos show completely different setup of vegetation. We were pretty much lost and just wondering in west direction, hoping to find something that we’ll recognize from map. 15min mistake – not that bad after all. It would be great that our mistakes stopped there, but they didn’t. It wasn’t a good day for orienteering.  On map a route choice looked pretty straight-forward. Attack point was a small pond just east of control (we’ve never found a pond). Already demotivated with our progress (or lack of it) we continued towards CP5. Very nice trail and easy navigation (Yaay) and we are at our next CP and refreshment point. Great. It took us almost 2 hours for 10km of the course. We wanted to approach CP8 directly from north, over a meadow (white on map) but it turned out to be dense forest (dark green on satellite photo) so we continued and took longer and safer route. No problems there. 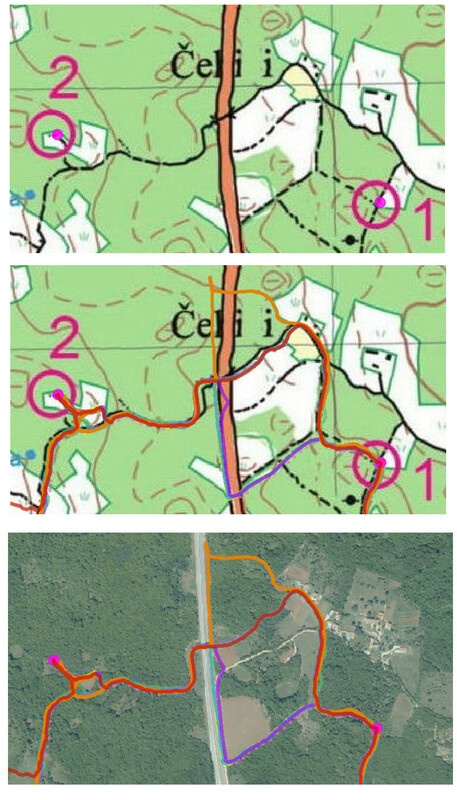 When you walk, you have more time to read a map, look at terrain and make decisions, so we had no problem finding CP9. We had luck deciding to approach it from east, because the CP was placed more in that direction than marked on the map. We continued our walk to CP10. No brainers there. A direct line to finish  All in all, I had fun.